Cheap, quick, flavorful finger food—there’s no better solution for lunch or dinner than a good taco. And when it comes to tacos, Rhode Island’s got you covered. Sample from the Ocean State’s wide selection of taco joints, which include food trucks-turned-restaurants, Tex-Mex places, and authentic mom-and-pop shops. Who can resist Tallulah’s carnitas, fish, or Al Pastor tacos? Tallulah’s ingredients are always fresh, bursting with wonderful flavor. During the winter months, you’ll want to do take out since seating in this little storefront can fill up fast. But stay for the sunshine during the summer, as Tallulah’s has great outdoor benches then. Gluten- and dairy-free eaters can rejoice—you’ve just found your new favorite taco. This mom-and-pop style joint in Olneyville whips up traditional Mexican food, loading their tacos with avocado and cilantro at a price you won’t believe. Try one of each of all of your favorite tacos at this food truck turned restaurant! Make sure to down your tacos in Paco’s fantastic Chipotle sauce. If you’re looking for an extra crunch, order the fried shells, too! Taco, Inc. serves up some seriously rockin’ tacos. At $2.50 per taco, you’ll want to grab several different meat and topping combos. And the best part? They deliver, too! With incredibly fresh salsa and perfectly crisp chips, you won’t need any other taco place. 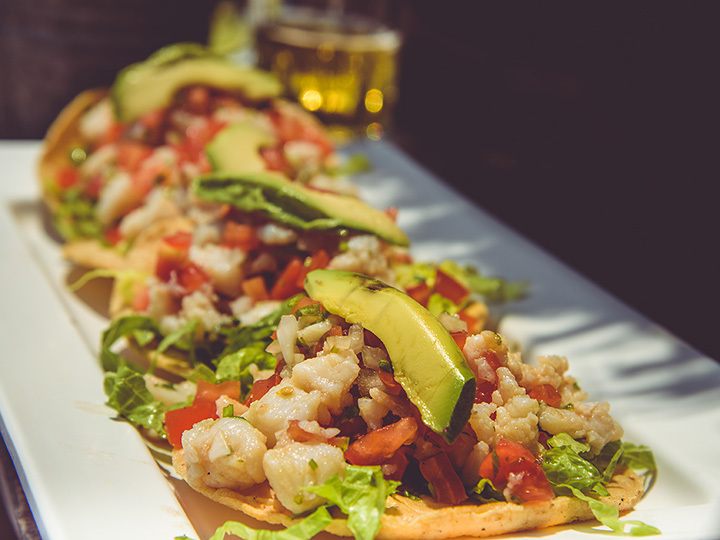 Make sure to try the Shrimp & Weed tacos or the pork belly tacos, rich and bursting with flavor. Looking for a more creative flavor combination? Give one of their unique burritos a shot! This cash-only place started as a food truck—a popular trend among taco restaurants. Heavy demand allowed them to open up a brick and mortar location. With generous portions offered, you’ll feel stuffed for the night after chowing down on some delicious pork, spicy chicken, or juicy steak tacos. The colors on the inside of Tio Matteo’s are almost as vibrant as the fresh ingredients contained in each one of the restaurant’s fresh and flavorful concoctions. The restaurant’s owner, Ross, makes sure to give great suggestions tailored to each of his customers. If you’re headed there with friends that don’t go usually for Mexican, fret not—Tio Mateo’s also offers American-style sandwiches to please their taste buds, too. Poco Loco calls itself the “best damn taco truck in town,” and we don’t doubt them. Now with a storefront location, they offer all of their classic favorites in a sit-down space. Try the BLT tacos or the Grande Green Monster taco, loaded with a generous helping of guacamole. Located in the Old Kenyon Building on Main Street, El Fuego offers a casual, surfer-dude vibe alongside its incredible tacos. Head out on Taco Tuesday for an incredible deal—you’ll be craving El Fuego for the rest of the week! Located along the beach and boasting a cool, outdoor vibe, Tortuga earns its title as Narragansett’s best taco place in town. If you’re looking for authentic Mexican, try Tortuga’s carnitas or their thick, spicy salsa. Go for a margarita, too—they’re some of the best you’ll have in a while.